The Reverend Anisa Cottrell Willis serves as St. Paul’s Associate Rector. She has her Master of Divinity degree from Yale and her Bachelor’s degree in Religious Studies from Rhodes College in Memphis, TN. She completed a residency in Clinical Pastoral Education at Chandler Medical Center at the University of Kentucky (with the focus areas of pediatrics, labor and delivery, and neonatal intensive care). Anisa also holds a Master’s in Social Work degree from University of Kentucky College of Social Work. 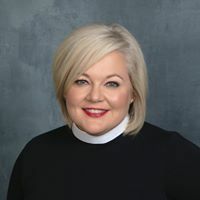 She was ordained to the Diaconate and Priesthood by The Right Reverend Don A. Wimberly in 1998 and 1999 at St James’ Church In Prestonsburg, KY. Prior to her ordination Anisa worked as a community mental health therapist for survivors of child abuse, sexual assault, and domestic violence in Floyd and Pike Counties in KY. She has served in various capacities in the Diocese of Lexington including her curacy at St. James, Prestonsburg, Assistant to the Rector, Holy Trinity, Georgetown, and Rector of The Church of the Advent, Cynthiana. While in Cynthiana the congregation instituted a bilingual Head Start program for farm workers that served as a model for other similar programs in the diocese and received the Bluegrass Community Action award for outstanding service toward the alleviation of poverty. Most recently Anisa spent ten years serving as a part time Chaplain at Cincinnati Children's Hospital Medical Center. She and Kevin have two teenage sons, and they enjoy attending their activities and sporting events and traveling together. She was also recently elected to the school board of Beechwood Independent Schools.